by show me how on 12 mei, 2015 <--! • 13:05 --> Reageren? 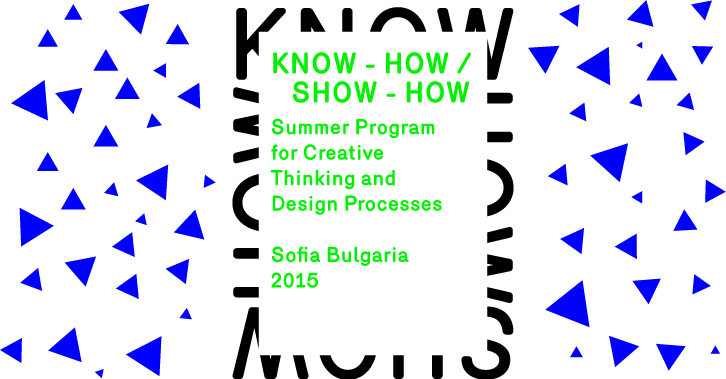 The first International Know-How / Show-How Summer Program for creative thinking and design processes will take place in Sofia Bulgaria. The program explores the interdisciplinary exchange of knowledge between the locality of the place, material potential and skills and contemporary designers, artists and students, stimulating sustainable innovation and knowledge development. The initiative is the first event of Know-How / Show-How lab that will be located in Sofia, Bulgaria. The project begins as a long-term collaboration between Foundation Know-How in Amsterdam, the Sofia-based organizations Culture Desk and Poststudio. Through workshops, exhibitions, exploratory studies and lectures various questions and topics will be examined. How is our behavior shaped by our local environment? How to work together, and create a beneficial effect on society? Can we define a new role for artists and designers of the present and the future? A main objective of the project is to create an international network for collaboration between designers and other professionals, engaged with social and urban issues. The program is open for participants from all over the World and its is suitable for professionals, students, emerging creatives, design enthusiasts and other interested.